Fifty-three ten-minute plays by 53 New England playwrights produced by 54 New England theaters presented in just 10 hours. It all happens when Boston Playwrights’ Theatre presents the 14th Annual Boston Theater Marathon and the fourth year of The Warm-Up Laps at the Calderwood Pavilion at the Boston Center for the Arts, 527 Tremont Street in Boston. Theatre Marathon performances will take place on May 20 from Noon to 10 p.m. (See listing below.) The Warm-Up Laps on May 19 will feature "A Book of Snow" by Joshua Faigen, "The Last Skywriter in the Universe" by Steven Bogart, and "Comes a Faery" by James McLindon. The Warm-Up Laps are presented in collaboration with The Boston Center for the Arts and their resident theaters and are free and open to the public. 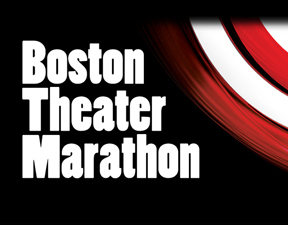 The Boston Theater Marathon is an award-winning all-day marathon of new ten-minute plays. The plays are chosen from over 400 entries from New England playwrights, and the selected plays are produced by New England Theatre companies who donate their time to this event. Generously supported over the years by the Boston University Center for the Humanities and by individual donations, the BTM gives net proceeds to the Theatre Community Benevolent Fund, an organization helping area theatre artists and companies in crisis. Many playwrights have subsequently enjoyed full-length productions with collaborating theaters because of the relationship forged during the Boston Theater Marathon. The Theatre Community Benevolent Fund (TCBF) is a non-profit theatre community organization administered by StageSource for the benefit of its individual and organizational members and the theatre artists who are or have been employed by those organizations who face dire need and require financial assistance. TCBF provides financial relief in a confidential, respectful manner to individual and organizations facing extreme illness, catastrophic acts of nature, and other events such as vandalism/theft, and who have limited or no resources with which to handle such occurrences. Tickets to the Marathon are $25 in advance, $35 at the door. An all-day pass allows patrons to come and go as they please. To purchase, call 617-933-8600 or visit www.bostonplaywrights.org. The Warm-Up Laps are free and open to the public; seating is limited and based upon availability.